In the coming edition of the WPT baseball, Japan belongs to one of the participating countries. The country will organize the Olympic Games in Tokyo in 2020. Baseball returns there at the Olympic level with the Kingdom of Netherlands team as possible participant. Perhaps baseball is still more popular in Japan than in America. In 2016, the Kingdom team played two contests of unprecedented exciting matches in the Tokyo Dome. Both matches were sold out with 50,000 enthusiastic spectators and were broadcast live on national television from Japan and in the Netherlands on FOX Sports. Two players from the Kingdom of the Netherlands do unprecedentedly well in Japan. 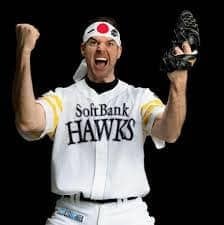 Rick van der Hurk, pitcher, became champion with the Fukuoka Softbank Hawks. Greatness Coco (Wladimir) Balentien, coming for the Yakult Swallows, we can safely describe as a god of Japanese baseball. In 2013 he broke the Japanese homerun record of 55 that had been in the books since 1964 in the name of Sadaharu Oh. He finished the season with 60 home runs. With this, Coco has gained eternal fame in professional baseball in Japan. In short, Japanese baseball is strong and lives tremendously. It is therefore great that the country of Nippon, Toyota, Sony and many more beautiful names, is participating in the World Port Tournament Baseball in the Neptunus Family Stadium.